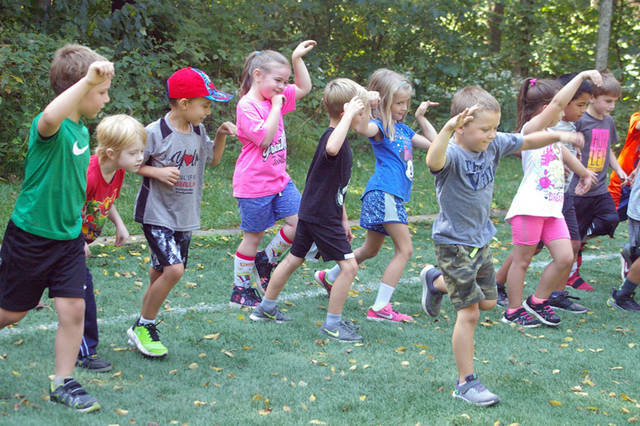 Students pretend to be flamingos during the Light Project’s kick-off event on Thursday at Chenoweth Trails. 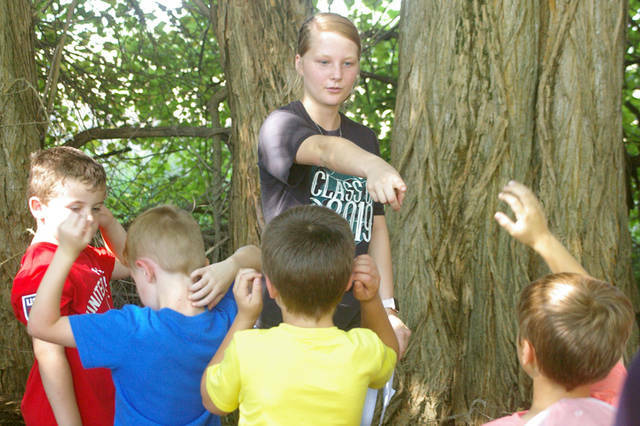 Students talk about nature during the Light Project’s kick-off event on Thursday at Chenoweth Trails. Students answer questions about what they saw on a hike during the Light Project’s kick-off event on Thursday at Chenoweth Trails. Students use crayons and paper to learn about textures in nature during the Light Project’s kick-off event on Thursday at Chenoweth Trails. 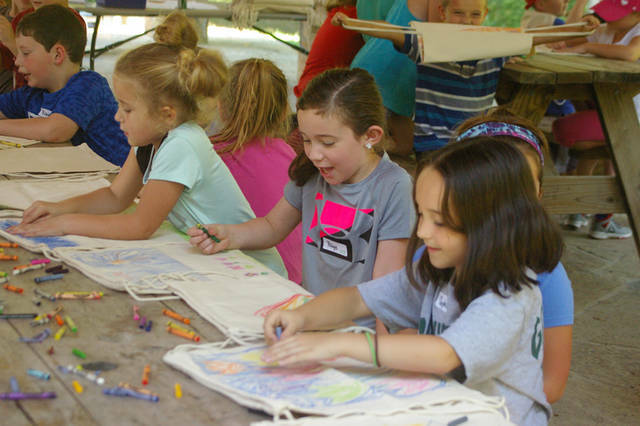 Students color on backpacks during the Light Project’s kick-off event on Thursday at Chenoweth Trails. 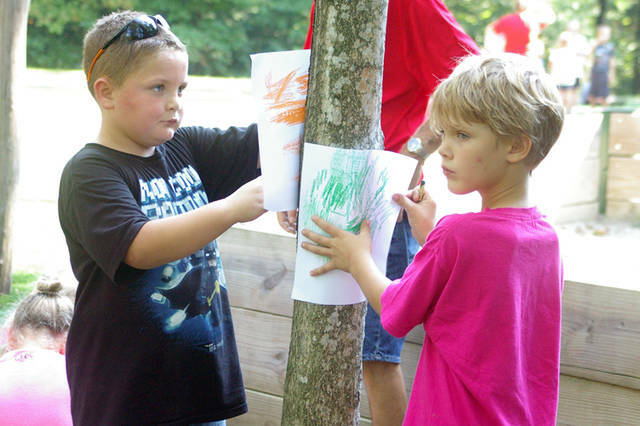 First grade students explore the outdoors during the Light Project’s kick-off event on Thursday at Chenoweth Trails. 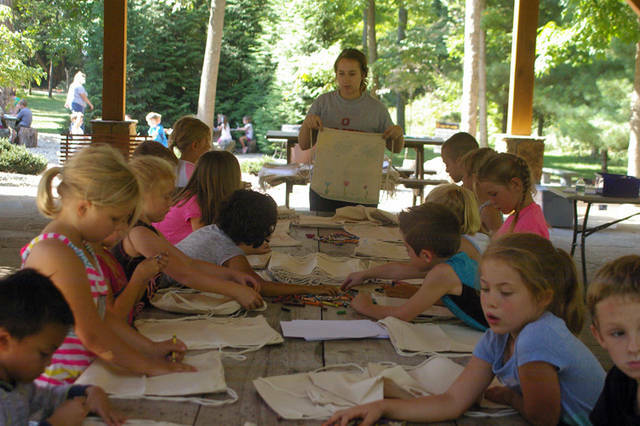 DARKE COUNTY – First grade students from nine Darke County schools connected with nature this week during The Light Project’s kick-off event for the 2018-19 school year. 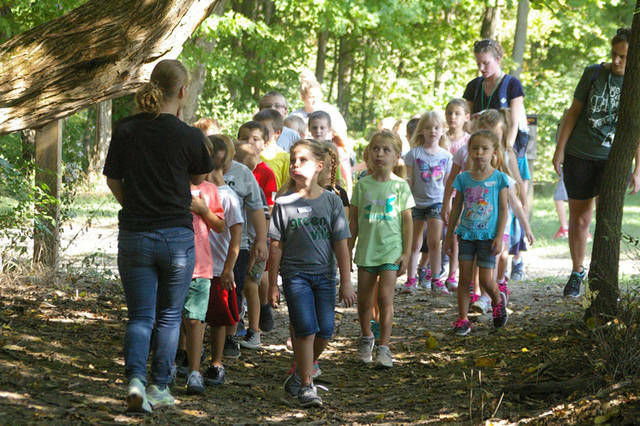 Chenoweth Trails – the Light Foundation’s 400-plus acre facility near Greenville – hosted students from Ansonia, Arcanum, Bradford, Franklin Monroe, Greenville, Mississinawa Valley, Montessori School of Greenville, Tri-Village and Versailles for the kick-off event. Arcanum, Bradford and Tri-Village students attended Wednesday’s session, Ansonia, Franklin Monroe, Montessori and Versailles students attended Thursday, and Greenville and Mississinawa Valley students attended Thursday’s session. 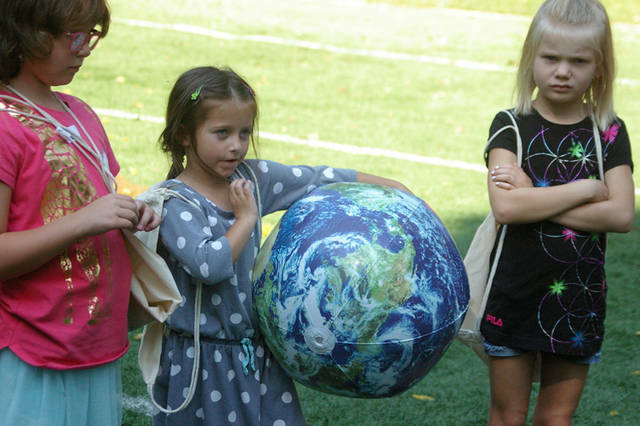 During their time at Chenoweth Trails students learned about outdoor safety, balanced rocks, decorated backpacks, toured yurts and participated in an Earth ball activity – all of which were designed to get them in touch with nature. Leading the activities were high school students from Arcanum, Franklin Monroe and Greenville’s Careers with Children program. “They all were wonderful,” Brubaker said of the high school volunteers. “I feel like it’s definitely adding value to our programs because you’re allowing the high schoolers to get out of their comfort zone and lead something, and then they’re mentoring these first graders coming in. The Light Project – named for an acronym for literacy, inquiry, getting outside, having fun and time spent with family – is a program through the Darke County Educational Service Center. It aims to get Darke County first graders interested in science and exploring the environments around them. The Light Project has partnered with the Light Foundation, a non-profit organization founded by Greenville native and three-time Super Bowl champion Matt Light. The Light Foundation utilizes outdoor activities to teach values of responsibility, accountability and hard work to youth. The Light Project will host Family Fun Days throughout the year during which children and their families can enjoy activities together. The first Family Fun Day of the 2018-19 school year will be from 10 a.m. to noon on Saturday at the Chenoweth Trails pond. Hooked on Fishing not on Drugs from Wayne Lakes will be in attendance to assist with the event. This entry was tagged Ansonia, Arcanum, Bradford, Chenoweth Trails, FM, Franklin Monroe, Greenville, Light Foundation, Light Project, Mississinawa Valley, Montessori School of Greenville, MV, New Madison Versailles, Pitsburg, Tri-Village, Union City. Bookmark the permalink.